I still own Gellaitry’s ya know! Just thought a little reminder was in order, here are my Gellaitry‘s with Redwood tenors and an original Kinnaird bass. I guess I should have recorded these with the mic in front of me instead of behind for once, these drones are loud with these reeds! CK chanter and Husk chanter reed this go around. The previous post had me playing these X-TREME drone reeds in Colin Kyo pipes, but today they’re in some 1950’s Robertsons. Adjustments to the reeds to get the tenor tops back at the hemp line were to bury the reed all the way into the seat and screw the tuning plug all the way in. The recordings below were artificially amplified as I forgot to reset the gain on my Zoom H2 after setting it to a quieter setting yesterday. I don’t think this amplification has distorted the audio as the program I manipulate mp3s in is made to splice mp3s without re-encoding them. Amplitude modulation should be trivial. You might hear a cell phone ring at some point. My bad. I played them for an hour today. Still no moisture on these premium versions of the reeds. I think I believe Chris now when he says they actively repel moisture. I need to try some other drone reeds again just to make sure they get wet; maybe Lubbock’s just so dry nothing gets wet. This bag is fairly new to me and it’s recently seasoned so I’m not accustomed to how wet it lets reeds get yet. I’ll play some Rockets in them tomorrow at band practice and see what happens and update this post with what I find out (Rockets weren’t wet either, I’ll to find an unseasoned bag to do this test in). Tonally, I think they’re solid reeds. Still a little tenor quiet, but I believe this lends just a little more ease when tuning the drones along with some added stability. The louder the harmonic overtones are (yes I know, kind of a redundant series of words) the easier it is to hear when you’re drones are out of tune. Presumably this would make your drones easier to tune, however, you need a finer and finer tuning motion to really lock in those higher overtones, so I say you can reach a point where those overtones are too loud and tuning is harder, because you can definitely hear they’re still out of tune and you’ve been at it for 5 minutes already. There’s a limit to how steady one can blow. When the higher overtones are attenuated, it may be harder to hear that the drones aren’t exactly in tune, but hey, that’s not a bad thing! I believe this is the main effect people speak of when they say a drone has a wide tuning range: the overtones are reduced such that you don’t hear the clash of the overtone frequencies between tenor drones, you just get to focus on the fundamental (lowest) frequency tuning. Thus if you wanted a more stable pipe, the easiest thing to do is pick a set of reeds with less overtone amplitude in the tenors, all else being equal. I might call this the MacDougall effect: reduced overtone amplitude leading to easier tuning and a perceivably more stable bagpipe. Alright, if I keep typing someone is going to cry heresy. Cowal Gathering, Susan MacLeod, and Captain Lachlan MacPhail of Tiree – for all you brave soloists live streamed yesterday during the Winter Storm competitions. Great stuff and thanks for putting yourself out there! Hector the Hero (James Scott Skinner), Iron Man (James Scott Skinner), and Orange and Blue – my fingers are done, but good snapshot of the drones in the slow air. 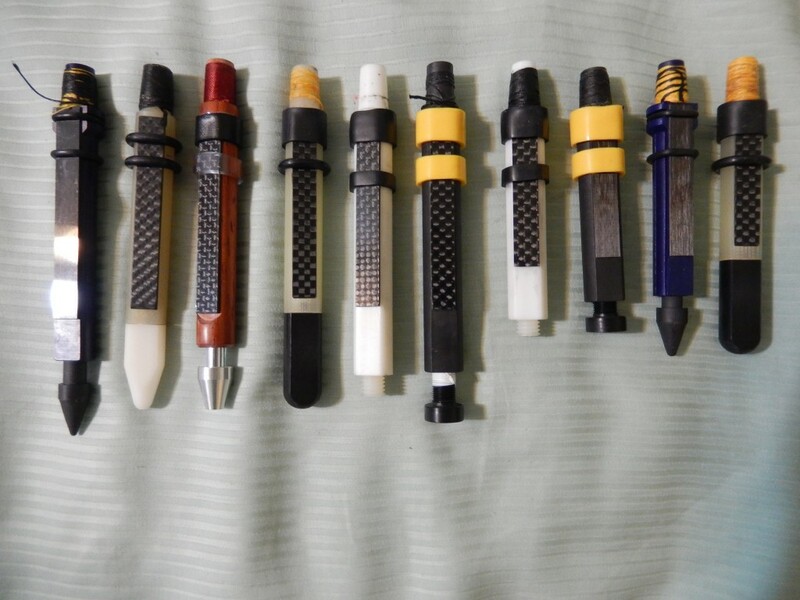 It took them a little while to hop over the pond to TX, and then winter break happened, but I’ve finally recorded the Premium X-TREME drone reeds I purchased from designer Chris Armstrong toward the end of 2014. Today they are played in a set of Colin Kyo bagpipes (not pictured, those are my 1950’s Hendersons). They’re “premium” reeds because some sort of hydrophobic material or coating comprises or is on the reeds which supposedly allows them to actively repel moisture. If I lived somewhere humid this might matter, but Lubbock is dry. Perhaps I should have spent less and gone with the regular version? I noticed a tad bit of moisture on them after a 45 minute playing session, but that evaporated in about 10 seconds after removing the drones from the stocks, so it would seem the stuff works (and that was in a bag that needs some seasoning). Chris actually mentions this effect in the instruction manual which must be downloaded, as it does not come with the reeds. The 45 minute session in the bag that was recently seasoned resulted in no visible moisture on the reeds upon removing the drones from the stocks. What do I think, you ask? I think the tenors could be just a tad bit bolder. I also think the bridles are too wide. The bridles being as wide as they are make them difficult to move effectively. This is exacerbated by how soft the bridle material is. It’s not a pillow, don’t get me wrong, but there is some give to it so it’s not certain if you actually moved the bridle or just squished it a little bit. As such, my tenor reeds are actually set up just a little too hard as I’m not a patient person, and I still think they’re a little too quiet. They proved to be steady reeds indeed and they sound nice. The tuning plug is threaded and a fairly tight fit so I don’t think teflon tape is needed to ensure the plug is airtight, though I did add some to the bass just to be sure. The range of motion of the tuning plug is very generous allowing the reeds to be tuned to a variety of pitches, or altered to allow your drones to tune just where you like them. Perhaps I need to set mine up so the tenor drones tune lower on the pins which results in an amplification of the E overtone and generally makes them more brassy sounding. 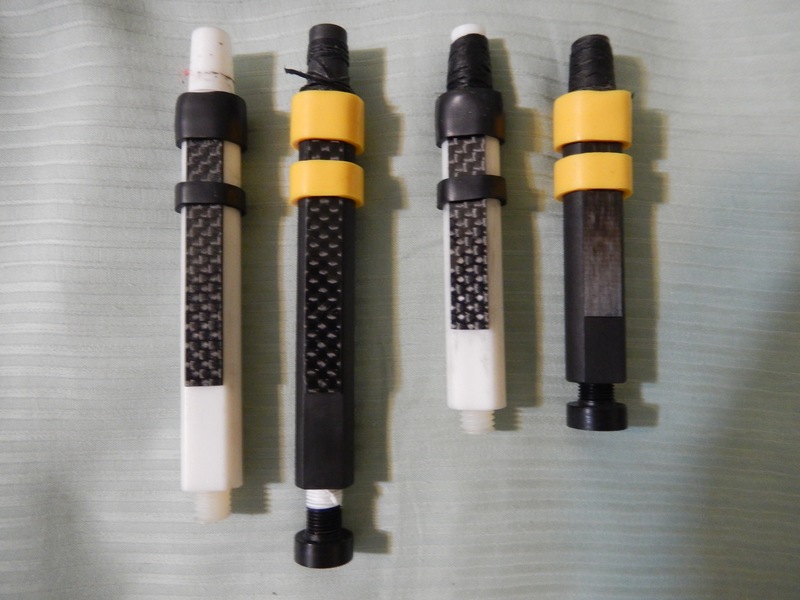 They don’t suffer from the buzz often associated with most carbon fiber reeds; in that regard they’re much like Murray Henderson’s Harmonic Deluxe drone reeds (white in the photo below). I will say, and I can be quoted as saying this to a few people prior to receipt of the reeds, that at the price the premium X-TREME reeds retail for ($130, non-premium are $100), I was going to be pissed if they were just hydrophobic Henderson Harmonic Deluxe (HHD drone reeds can be had for only $66, although I find them finicky as to whether they want to play some days). I almost got really pissed when I put the bass reeds next to each other, but the tenors are different so I calmed down. The HHD bass is a very popular one so I don’t guess I should be too surprised. Of course, there could also be differences beyond the surface so I won’t judge a book by its cover. 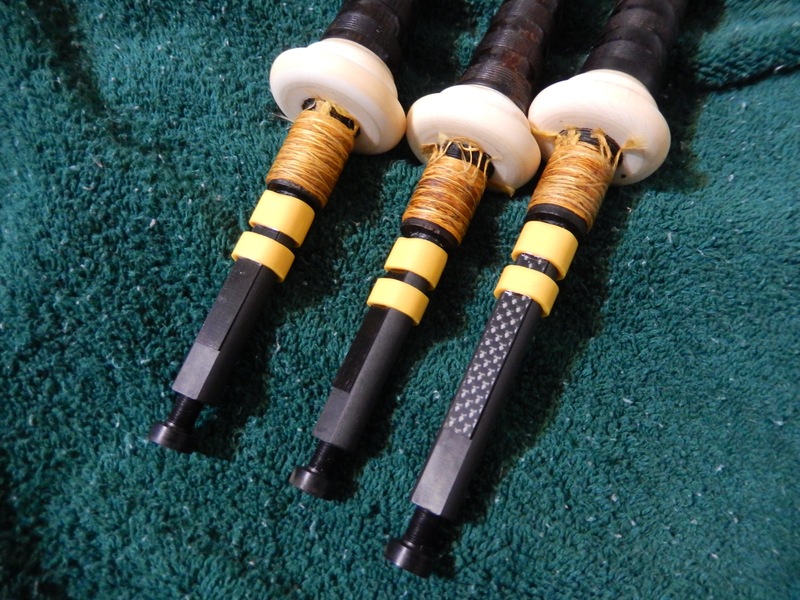 Here’s a shot of most commercially available carbon fiber tongued drone reeds. From left to right: Crozier carbon, Robertson spec Rocket, Redwood, Kinnaird, HHD, X-TREME, HHD, X-TREME, Crozier carbon, Kinnaird. Ah crap, I forgot the Canning bass, oh well, it looks like the Kinnaird but the body is brown and it uses a flat bridle. Below you’ll find 3 recordings, 2 with the drones pointed at the microphone and 1 chanter side to help you get a better idea of the relative volumes. The pipe chanter is a blackwood Colin Kyo with a Gilmour reed in it that if I had to guess, has 4 chips in it. I am also currently working on blowing out the chanter reed more, so sometimes the high A is a little flat with some crow.